– We’ve made the choice to stop sales of Pegoretti frames here at Competitive Cyclist. 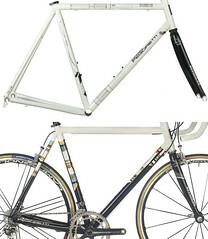 Dario’s bikes continue to be what they’ve always been -- beautiful to behold and beautiful to ride. As a human he’s no less radiant and humble than he was a decade ago when we first got involved with him and his name had none of the currency it now possesses. Our decision is rooted in a few things, but the primary reason is the trend we’ve seen in our Pegoretti frame sales: The proportion of stock to custom has tipped heavily (shall we say completely?) over to custom. That’s not a problem in itself, except that it seems we subscribe to an old-fashioned notion of custom where it’s a blessed opportunity in life to surrender the need for critical decision-making, and instead you can go in silence and confidence as you hand yourself over to a master. How many times in life do you get to do that? The best custom Pegorettis have always been made of 4 ingredients: Dario’s vast experience, his tape measure, the 3 questions he’ll ask you, and your silence. Custom seems to mean something different now, where personal urges get veto power over the very thing you’re paying for: The know-how of the gifted builder. It’s a recipe for unhappiness for everyone involved. You don’t give instruction to the master tailor, the pilot, or the Michelin-starred chef. From whence does the license come to do so with the framemaker? 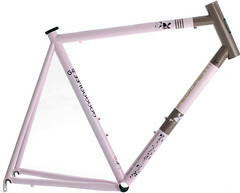 (1) Buy a stock size frame. There’s a reason why stock geometry exists -- it works for almost everyone. In terms of buying, waiting for delivery, riding, and owning -- the best Pegorettis are stock Pegorettis. (2) If you must go custom, first take a vow of silence, then track down Dario in person (at Interbike, at the NAHBS, in Trento -- he’s accessible) and let him do his thing. Don’t expect a religious experience. Start to finish it’ll take <2 minutes. When Dario is done measuring he'll hand you a piece of paper with his notes to himself and you can take it to your dealer and they can fax the paper in. They even get to be silent. That sort of focused interaction has a purity to it that’s missing from the retail Pegoretti experience as it’s most often had, where the customer expresses curiosity & predispositions about Pegoretti to the bike shop; the bike shop (eager to make the sale) validates those predispositions then transmits them to Gita; Gita translates these wishes and in what we’re told is timely communication passes them along to Dario. It’s a long and arduous chain of communication for a product whose success, ironically, all too often isn’t measured by its actual ride. The more customized the frame order is, the greater the extent to which success gets measured by whether the geometry is accurate down to the last mm, and whether the paint is correct down to the exact hue. It becomes a kitchen remodel, not a bike order. We’ve had too many customers who place significant emotional weight onto their custom Pegoretti order and expect it, after 2+ years of waiting, to be life-changing. If their predispositions or a single personalized detail gets lost in the course of commerce it leads to Kiekegaardian existential terror. These feelings of anger and disappointment aren’t unjustified, per se, but the very act of business is about the balance between risk and reward and the amount of money to be made selling Pegoretti is now outweighed by the costly risk of this customer disappointment, with the main cost to Competitive Cyclist being the time it takes to clean up the situation. This is why stock framesets are so great: People focus purely on the ride. The same holds true with getting that piece of paper from Dario for a custom, where what you’re paying for is his vision and his execution. You’re paying $4k so you don’t have to deal with details. The final factor in our decision is the recently announced pricing scheme of Pegoretti where, due to the sizeable lead times for delivery and EUR/USD volatility, there is no longer a set price but instead a day-to-day spot price based on factors to which we have no visibility here. We’d never discourage anyone from buying a Pegoretti. In fact, if you’re interested you should contact Chad at the best bike shop in California, Above Category. Or if you’re on the east coast, holler at Craig at International Bike in Boston to place your order. Both of them have big experience with Pegoretti, and they will take fantastic care of you. And as far as Competitive Cyclist goes, we bid adieu with huge respect and love for the man and the brand, as symbolized by this long-shuttered section of the site we built many years back when Dario first became ill.
A couple of pieces of related housekeeping: (1) If you currently have an open order for a Pegoretti with us, your order is still queued up and our decision will have no impact on your frame. We’ll still take delivery on your bike and take care of you. (2) We have a stock 54cm Marcelo in ‘Baci’ and a stock 58cm Love #3 in ‘Manovella’. We’re eager to find a happy home for these final 2 available frames in our inventory and towards that end will be flexible on price. And one final note: For those who might think our recent addition of Bianchi is related in any way to our move with Pegoretti, that isn’t the case. Other than a shared country for their company HQ’s (and that both have a storied history with Marco Pantani), the connection is nil. It’s mere coincidence that one went up on our site when the other left. Truth be told, we’ve been agonizing about our position on Pegoretti for awhile now. 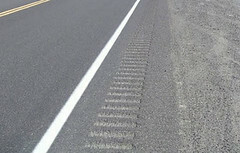 – Blog entry of the year so far in 2010 is over at Bicycle Specialties, and it’ll take a lot to beat it. Check out David Millar’s winterized training bike. And the Arenberg Forest Youtube link at the bottom of the entry is glorious. – Lost in the media frenzy about Joao Correia diving in the deep end with the Cervélo Test Team is the fact that the last person worth a flip at Bicycling is now gone. The Spooky blog hits the nail on the head, and I don’t see how it’s gonna do anything but get far worse there. – In case you’ve been keeping notes on doping trends, the last 3 significant American doping cases have all involved DHEA. This article over at Pez nicely puts to bed the notion (and the most-often used defense) that these positives all came from contaminated Flintstone chewables. – A good number of our customers raced at Master’s Nationals last year. Did you see that USA Cycling pushed the date out by over a month? Instead of late June it’s now early August.